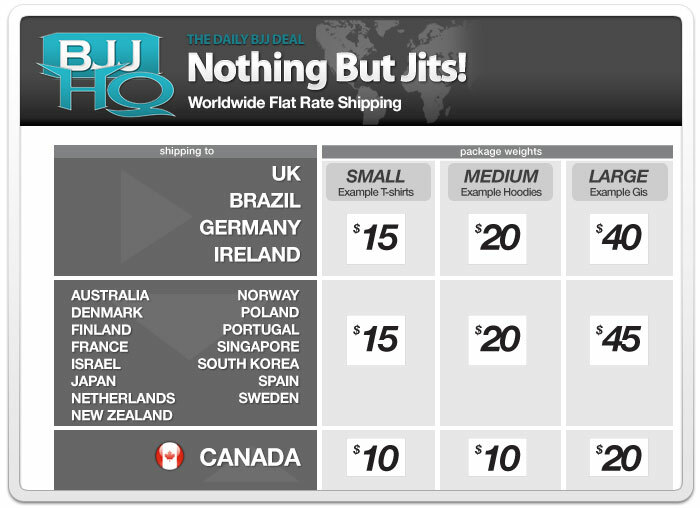 BJJHQ.com is the World's Best BJJ Daily Deal site. Following the latest fighters, trends and brands, we strive to consistently offer you the best deals around. We sell one item per day until it is sold out or until 11:PM Eastern Time when a new deal begins. What is the schedule for new items? We offer a new item every day at 11PM Eastern Time. When a new item goes on sale, the previous item is no longer available. I missed yesterday's item, how can I get one? You can't. When a deal ends it's final. I'd like to speak with a live person, can I call you? We'd love to chat, but aren't hanging around the phones all day. Email us at cs@BJJHQ.com If you want us to give you a call back, include your number in the email. What if I don't like an item I bought? What? How's that even possible! I mean... well, we don't take returns or exchanges. We just sell for cheap. If you really don't want it anymore, put it on eBay (and probably make a profit) or give it to your cousin who will love you forever for it. Most items ship the next business day. Occasionally items take longer to ship. Average delivery time should be between 5-14 days for US & Canadian Orders. UK & AU orders may take between 7-21 days to arrive, but they can sometimes be stuck in customs which would cause additional delay. Can I return a defective product? Our bad. Don't ship it back. Shoot us an email at cs@BJJHQ.com and we'll take care of it for you. How many items are available in a given sale? One item for sale each day. Can I buy more than 1? You can only buy one at a time. If you want more than one, we don't blame you. Just return to the home page after purchasing and do it all over again. You can pay for your orders using VISA, MasterCard, American Express, Discover card or PayPal. Which countries do you ship to internationally? USA shipping is always $5 and delivered via USPS or UPS. Large Parcel - example: Gis. How are the packages marked? We do our best to reduce the likelihood that BJJHQ shoppers will have added customs fees, import taxes, and other costs sometimes associated with international shipments. Orders will be shipped in a plain package. Although there are no guarantees, this helps ensure that our customers do not get surprised by additional costs levied by their country's postal service. BJJHQ is not responsible for, nor can we offer, any specific advice regarding any customs related fees that you may incur. For specific information, please consult with your local government import office. BJJHQ only collects New York sales tax for orders shipped to an address within New York State. Sales tax is not a VAT, and cannot be recovered by non-USA visitors when returning home. Do you have a Fraud Protection Policy? Of course! For your protection orders are subject to BJJHQ's verification procedure. You may be asked to verify that you are the card owner, or that the order information is legitimate. This may include a request for a copy of your credit card (front and back), which can be transmitted by fax when necessary. Should your order require verification, you will be notified by email. BJJHQ reserves the right to refuse an order when the address or credit card is not verifiable. If so, a refund will be issued via the same method you used to make your payment. Are all prices in US Dollars? Why, yes! The final amount shown in your cart is in US Dollars. The product price does not include customs, duties and/or taxes. Your credit card company may charge you a conversion fee. We will charge your credit card in US Dollars. Likewise, refunds will be issued in US Dollars. The refunded amount may be more or less than the purchase price due to fluctuations in exchange rates. BJJHQ features a community for discussions about the daily deals, past and present. The Daily Deal Archive features past deals.